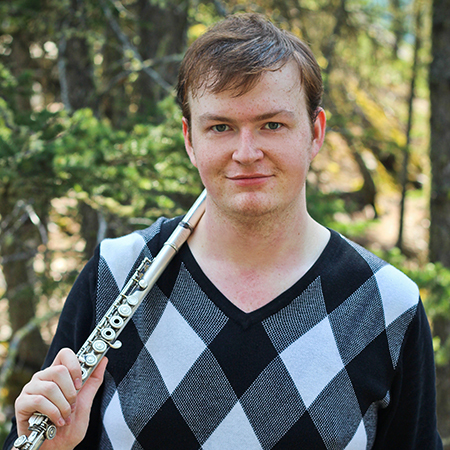 Chris James* holds the Assistant Principal Flute/Piccolo position with the Vancouver Symphony. Previously a member of the Memphis, Ann Arbor, and Missouri Symphonies, he has also appeared with the Detroit, Toronto, Nashville, and Albany Symphonies, the National Arts Centre Orchestra, the National Ballet of Canada Orchestra, and the Buffalo Philharmonic. Also an active chamber musician and soloist, he was recognized for his achievements in the CBC’s “30 Hot Canadian Classical Musicians Under 30” in 2017. In addition to his private teaching studio, Chris has been invited to teach at the Universities of Memphis, Central Arkansas, and British Columbia. In demand as an adjudicator, he has served in this capacity for the South East Michigan Flute Association, the Mid-South Flute Society, the Toronto, Oshawa, and Ottawa Kiwanis Festivals, Rhodes College, and the University of Michigan.